This summer, 40 million Americans are expected to move or relocate according to the U.S. Census Bureau, undertaking the daunting task of sorting through odds and ends, packing boxes, and deciding what to toss and what to put in storage. Oddly enough, there is a day devoted to all those people buried in bubble wrap and boxes – National Moving Day. 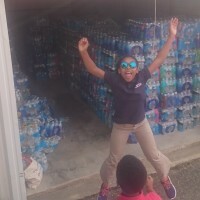 Occurring annually on the Tuesday after Memorial Day, National Moving Day marks the official start of moving season, and one of the busiest days of the year for moving and storage. According to a new study by Wakefield Research for SpareFoot, more than half of Americans describe their home as cluttered and 61 percent believe moving is the best opportunity to declutter their home. 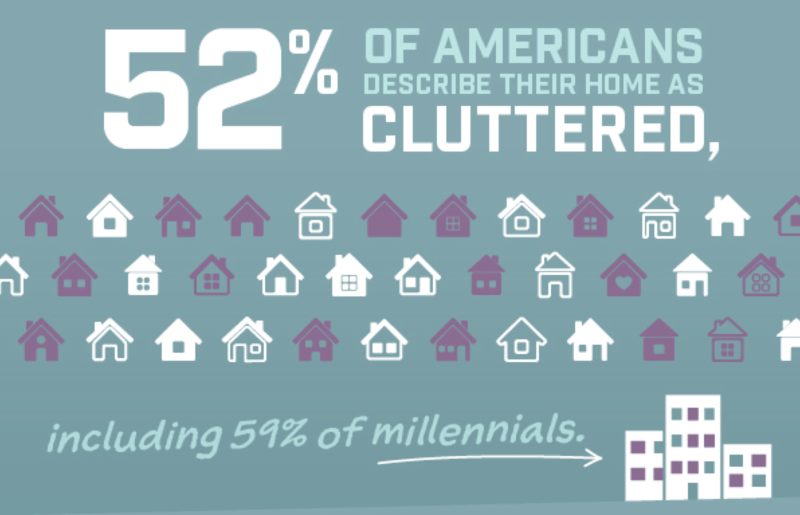 SpareFoot’s study – called the Storage & Moving Study – explores the extent of American clutter, evaluating consumer storage trends and moving habits. The findings reveal that clutter affects many facets of Americans’ lives, including time management, personal relationships, and health. Guilt can be a powerful emotion when it comes to holding onto our things. 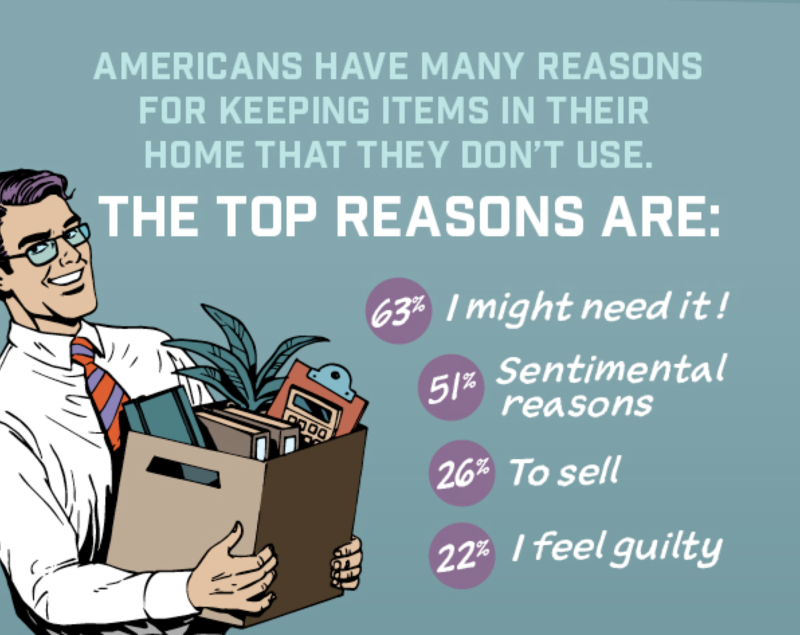 The study found that 91 percent of Americans have kept an item because they felt guilty getting rid of it. 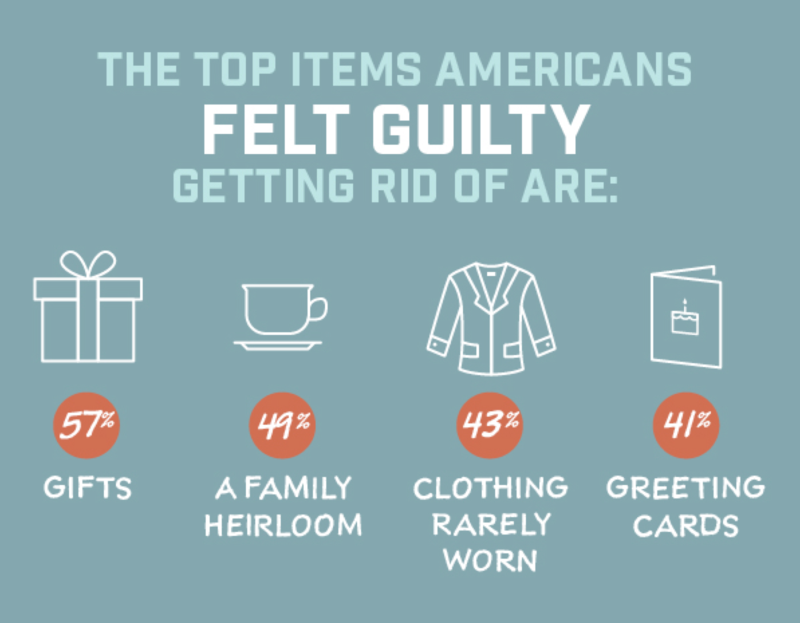 The top items respondents felt most guilty getting rid of include: gifts (57%), a family heirloom (49%), clothing they rarely wore (43%), greeting cards (41%), and drawings or crafts from their child (21%). Only two percent of respondents cited laziness as a reason. 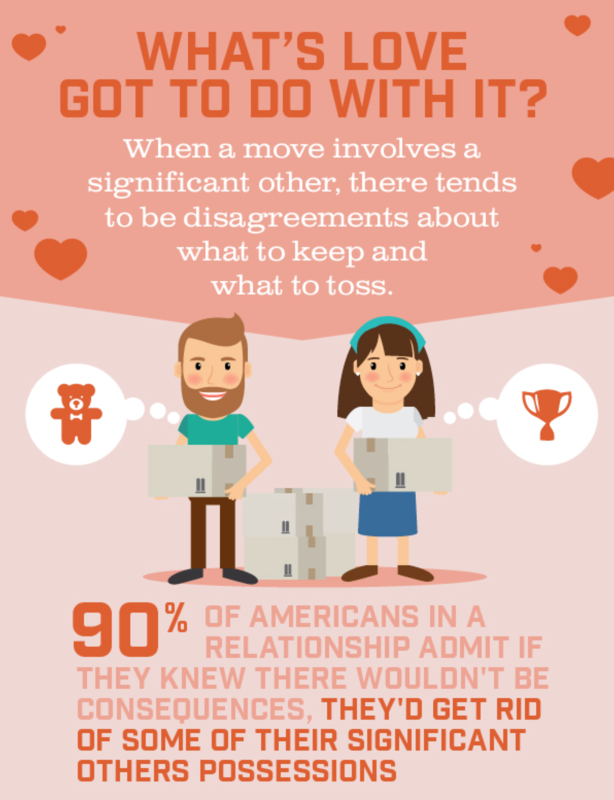 Whether moving in with a significant other for the first time, or moving to a new home with them, disagreements often arise about what to keep and what to toss. According to the study, 90 percent of Americans in a relationship admit if they knew there wouldn’t be consequences, they’d get rid of some of their significant other’s possessions. 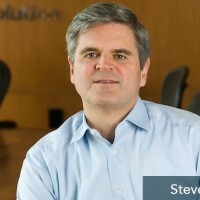 However, many Americans take others messing around with their stuff seriously. One in three Americans, and nearly half of Millennials, admit they would consider breaking up with someone if that person got rid of something that had sentimental value to them. 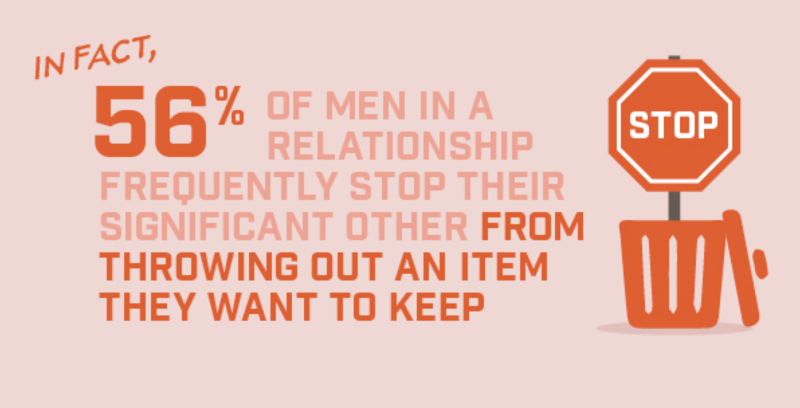 In fact, 56 percent of men in a relationship said they frequently stop their significant other from throwing out an item they want to keep. 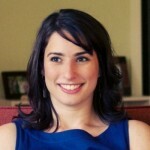 To avoid going head-to-head, Dr. Bartell emphasizes that compromise is crucial. If a decision cannot be made right away, consider putting items in storage until the stress and emotion of moving has settled down. Moving with kids is a unique parenting challenge, especially when it comes to sorting and boxing their things. However, some parents are banking on flying under the radar when it comes to getting rid of their children’s stuff. 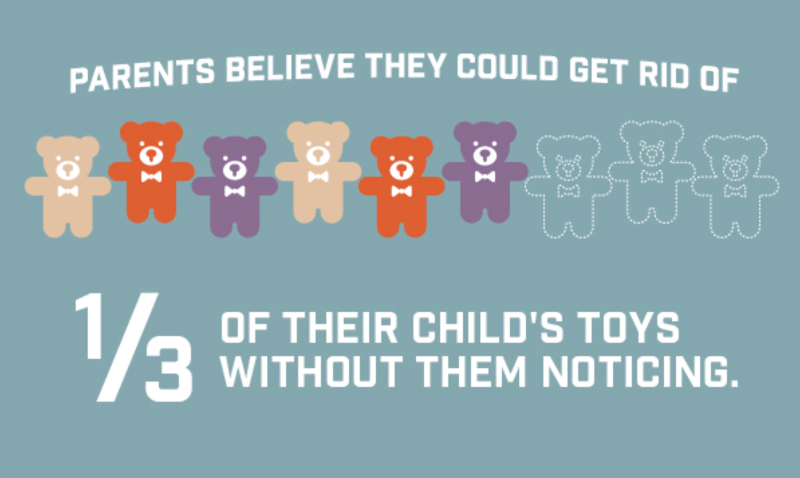 Parents believe they could get rid of 33 percent of their child’s toys, on average, without them noticing, and one-third believe they could get rid of more than half of the toys! 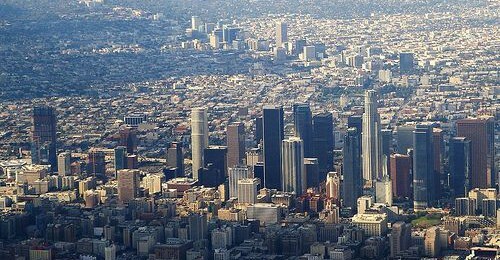 In examining why Americans move, the study found that one-third say they have moved for a job, and about the same number say they have moved because of the cost of living. 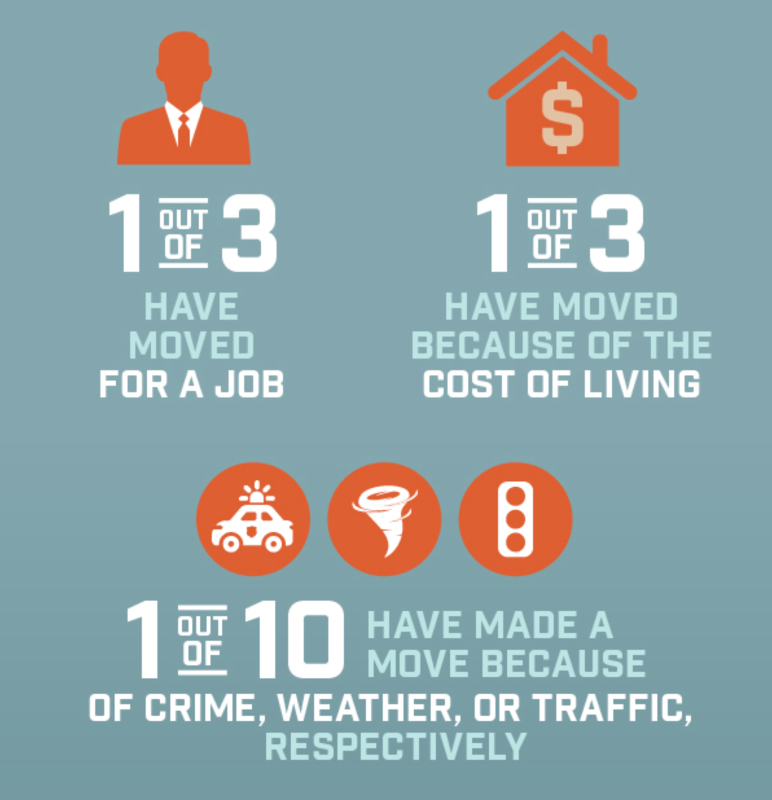 Further, about one out of ten Americans have made a move because of crime, weather, and traffic, respectively. 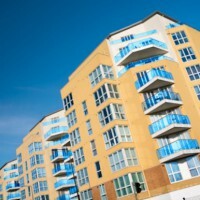 People consider moving for so many reasons, even if they don’t necessarily follow through. 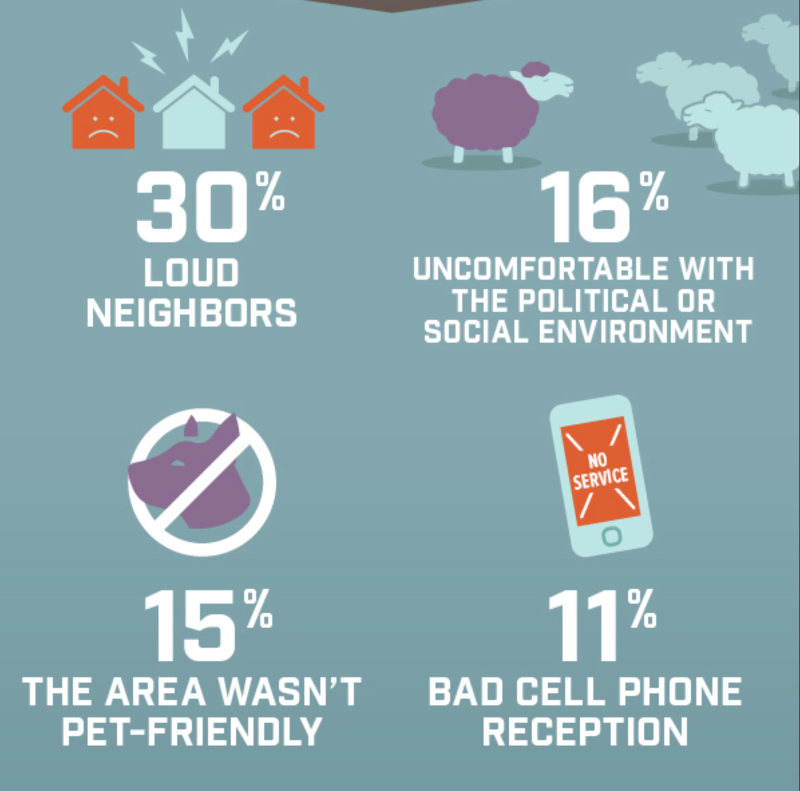 According to the survey, loud neighbors (30%), cell phone reception (11%) and haunted houses (7%) were among the reasons Americans have considered moving. And as election season is upon us, the study also found that 68 percent of Americans would seriously consider moving to another country if one of the candidates became President. 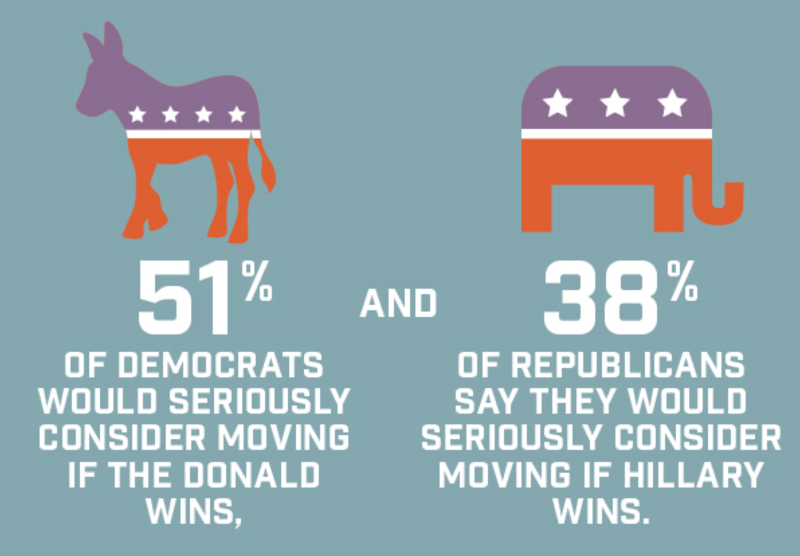 Leading the list by a wide margin is Donald Trump (41%), followed by Hillary Clinton (25%). 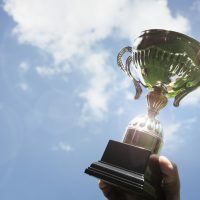 To access more study results, read tips on moving, decluttering, and organization, access checklists and insider information on moving to a new city, and more, visit http://www.sparefoot.com/moving. SpareFoot is the largest marketplace for storage, making it simpler to move and store your stuff. Our website lets you compare the most storage options nationwide and pick the best solution for your needs, whether it’s traditional self-storage or Full-Service Storage. With the most up-to-date information on storage available, SpareFoot makes finding and reserving storage the easiest thing to cross off your to-do list. The SpareFoot Survey was conducted by Wakefield Research among 1,003 nationally representative U.S. adults ages 18+ between April 6th and April 19th, 2016, using an email invitation and an online survey. Quotas have been set to ensure reliable and accurate representation of the U.S. adult population ages 18+. Results of any sample are subject to sampling variation. The magnitude of the variation is measurable and is affected by the number of interviews and the level of the percentages expressing the results. For the interviews conducted in this particular study, the chances are 95 in 100 that a survey result does not vary, plus or minus, by more than 3.1 percentage points in the nationally representative audience from the results that would be obtained if interviews had been conducted with all persons in the universe represented by the samples.